For some people the first sign that decimalisation was with us came with the arrival of the Jictar Report for the week ending 10 January. The cost per thousands, previously expressed in shillings, were in new pence. Sales Department and their clients are already getting used to the new type of information. Example: a 30 second commercial slotted at the end of This Is Your Life on 6 January reached 1,920,000 homes in the London ITV area at a cost per thousand of 83 new pence (previous cost per ’000 would actually have been 16/7d but rounded up in the ‘old’ reports to 17/-). For most of us Decimalisation is still something to be grappled with. D Day, Monday 15 February, is however only a fortnight away, and Chief Accountant Max Lawson and his department are making their final preparations in a process of changeover and indoctrination that has been going on for almost two years. Mr. D. Day our aptly-named decimal expert (otherwise known as Dennis the Chief Cashier), explains the new coins to Phyllis Beeson, Teddington receptionist. Phyl will man one of the Change Stations from 15 February. One move will affect us all. From Monday 15 February, our restaurants, bars and trolleys will only accept the new decimal coins. This will avoid confusion and cut down delays in service. But to make purchases easier for the staff, Accounts Department is establishing a number of ‘change stations’ at crucial points. Old pence and threepenny pieces may be changed in multiples of 6d or 1/- for the new 2½p or 5p coins. Chief Cashier’s office during normal working hours. Reception desk in the main hall during normal working hours. The ground floor of the Restaurant from 12 noon to 2 p.m. from Monday to Friday. The Petty Cashier’s office (3rd Floor) during normal working hours. The Reception desk in the main hall during normal working hours. The cafeteria from 12 noon to 2 p.m. daily from Monday to Friday. Mrs. Luccarini will change old pence for new during normal working hours. Apollo 14 is due to land on the moon on the morning of Friday 5 February, and the astronauts will attempt a moon walk that afternoon. The team at ITN Moonbase will be Alastair Burnet, Peter Fairley, Paul Haney, Dr. Robert Jastrow, Head of the U.S. Institute of Space Studies, and Sqdn./Ldr. Gordon Sharp, of the Institute of Aviation Medicine at RAF Farnborough. Robert Hargreaves will be at Houston Space Centre in America. 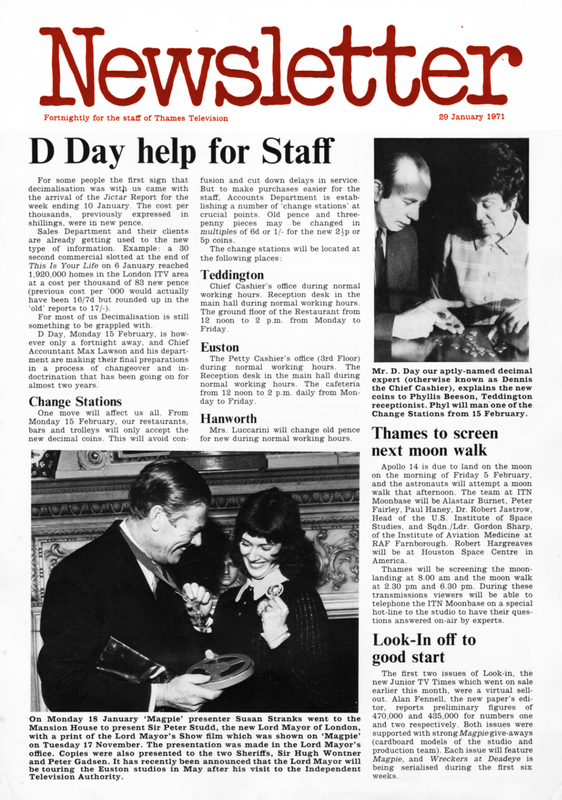 Thames will be screening the moonlanding at 8.00 am and the moon walk at 2.30 pm and 6.30 pm. During these transmissions viewers will be able to telephone the ITN Moonbase on a special hot-line to the studio to have their questions answered on-air by experts. On Monday 18 January ‘Magpie’ presenter Susan Stranks went to the Mansion House to present Sir Peter Studd, the new Lord Mayor of London, with a print of the Lord Mayor’s Show film which was shown on ‘Magpie’ on Tuesday 17 November. The presentation was made in the Lord Mayor’s office. Copies were also presented to the two Sheriffs, Sir Hugh Wontner and Peter Gadsen. It has recently been announced that the Lord Mayor will be touring the Euston studios in May after his visit to the Independent Television Authority. 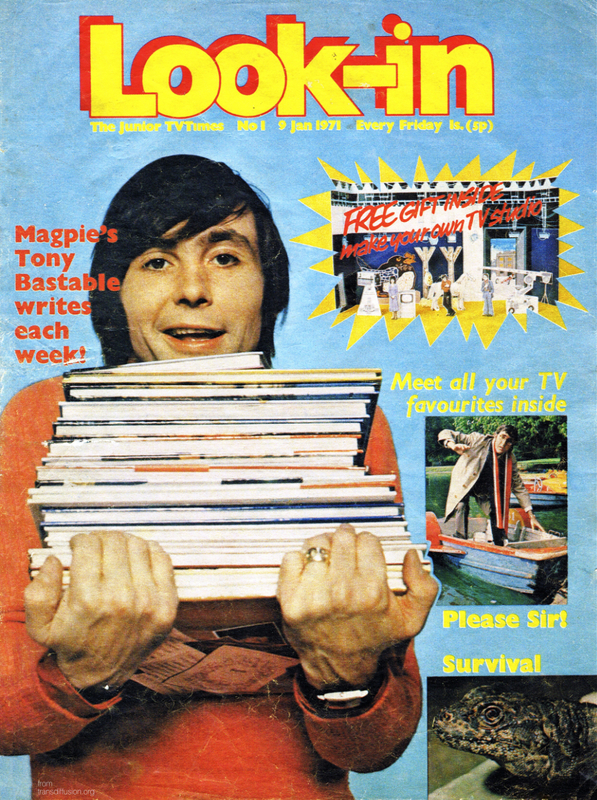 The first two issues of Look-in, the new Junior TV Times which went on sale earlier this month, were a virtual sellout. Alan Fennell, the new paper’s editor, reports preliminary figures of 470,000 and 435,000 for numbers one and two respectively. 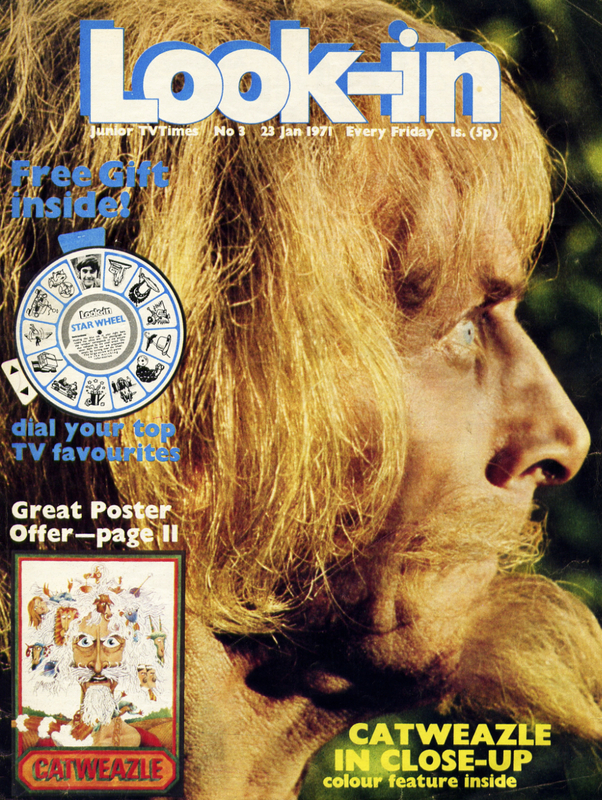 Both issues were supported with strong Magpie give-aways (cardboard models of the studio and production team). Each issue will feature Magpie, and Wreckers at Deadeye is being serialised during the first six weeks. 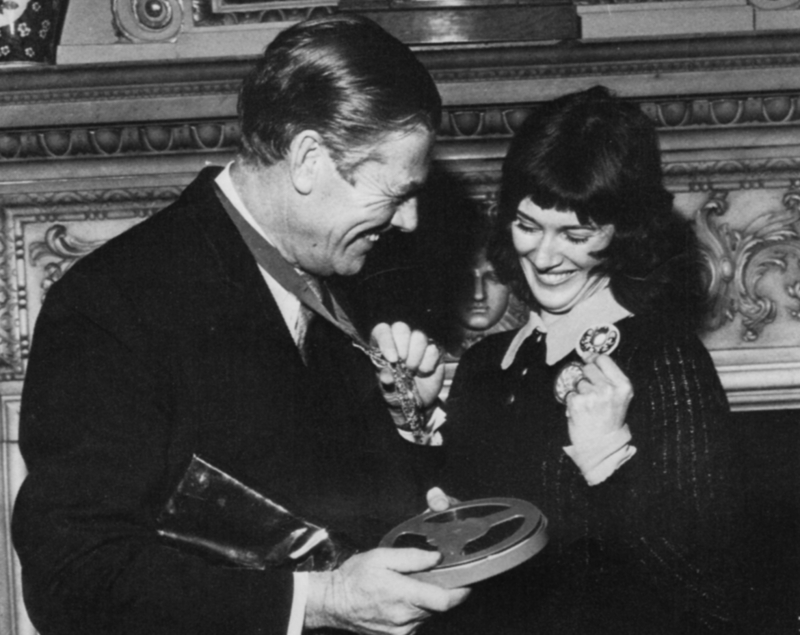 Magpie, The Benny Hill Show, Writer’s Workshop and producer Reg Collin have all reached the short-list of nominations for the 1970 Society of Film and Television Arts Awards. 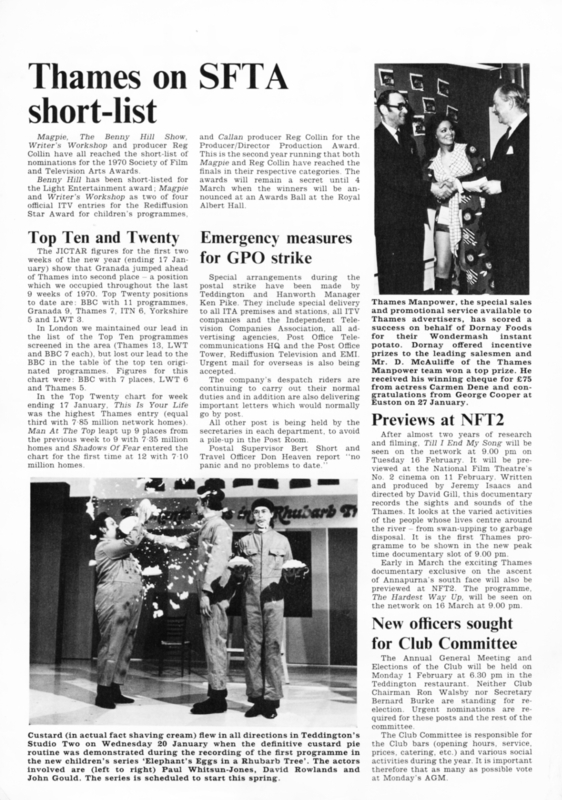 Benny Hill has been short-listed for the Light Entertainment award; Magpie and Writer’s Workshop as two of four official ITV entries for the Rediffusion Star Award for children’s programmes, and Callan producer Reg Collin for the Producer/Director Production Award. 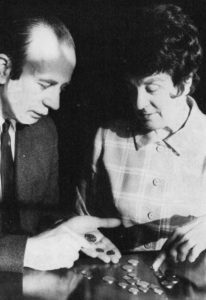 This is the second year running that both Magpie and Reg Collin have reached the finals in their respective categories. The awards will remain a secret until 4 March when the winners will be announced at an Awards Ball at the Royal Albert Hall. 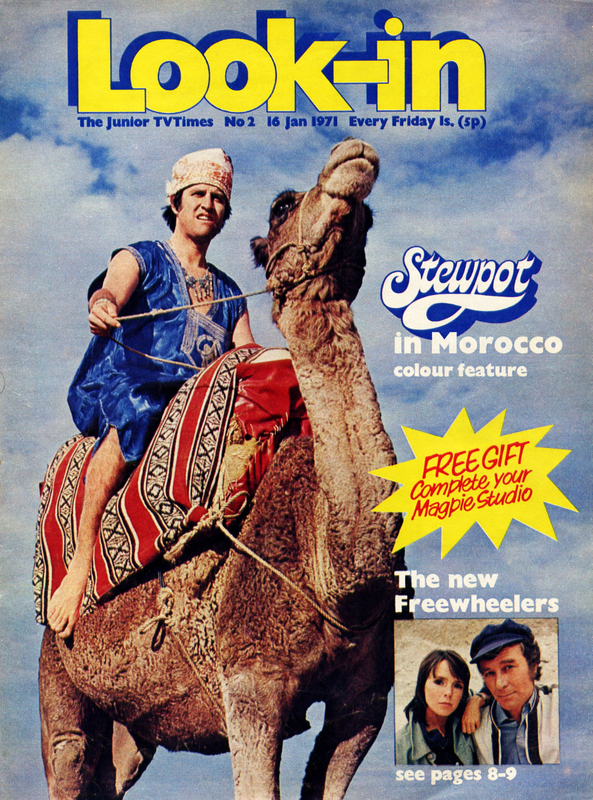 The JICTAR figures for the first two weeks of the new year (ending 17 January) show that Granada jumped ahead of Thames into second place – a position which we occupied throughout the last 9 weeks of 1970. Top Twenty positions to date are: BBC with 11 programmes, Granada 9, Thames 7, ITN 6, Yorkshire 5 and LWT 3. In London we maintained our lead in the list of the Top Ten programmes screened in the area (Thames 13, LWT and BBC 7 each), but lost our lead to the BBC in the table of the top ten originated programmes. Figures for this chart were: BBC with 7 places, LWT 6 and Thames 5. In the Top Twenty chart for week ending 17 January, This Is Your Life was the highest Thames entry (equal third with 7-85 million network homes). Man At The Top leapt up 9 places from the previous week to 9 with 7.35 million homes and Shadows Of Fear entered the chart for the first time at 12 with 7.10 million homes. Special arrangements during the postal strike have been made by Teddington and Hanworth Manager Ken Pike. They include special delivery to all ITA premises and stations, all ITV companies and the Independent Television Companies Association, all advertising agencies, Post Office Telecommunications HQ and the Post Office Tower, Rediffusion Television and EMI. Urgent mail for overseas is also being accepted. The company’s despatch riders are continuing to carry out their normal duties and in addition are also delivering important letters which would normally go by post. All other post is being held by the secretaries in each department, to avoid a pile-up in the Post Room. 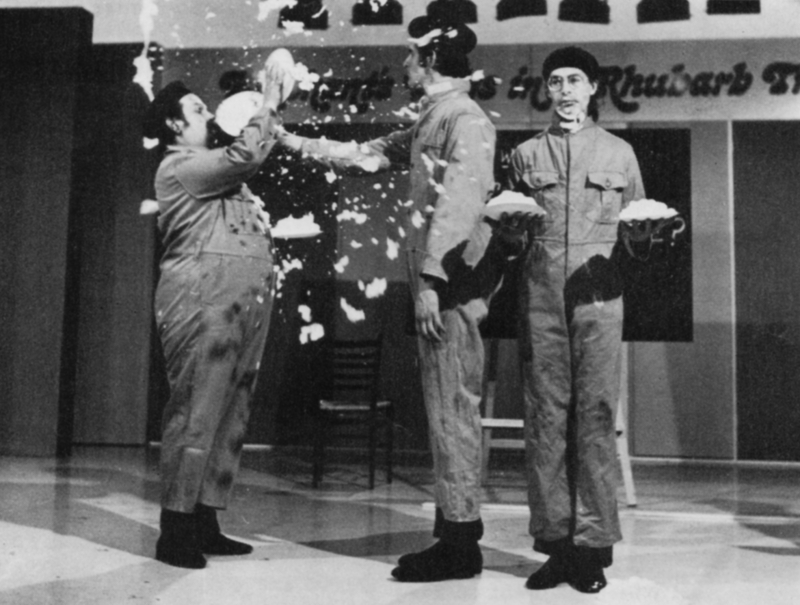 Custard (in actual fact shaving cream) flew in all directions in Teddington’s Studio Two on Wednesday 20 January when the definitive custard pie routine was demonstrated during the recording of the first programme in the new children’s series ’Elephant’s Eggs in a Rhubarb Tree’. The actors involved are (left to right) Paul Whitsun-Jones, David Rowlands and John Gould. The series is scheduled to start this spring. Thames Manpower, the special sales and promotional service available to Thames advertisers, has scored a success on behalf of Dornay Foods for their Wondermash instant potato. Dornay offered incentive prizes to the leading salesmen and Mr. D. McAuliffe of the Thames Manpower team won a top prize. 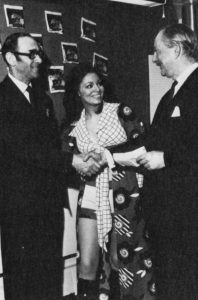 He received his winning cheque for £75 from actress Carmen Dene and congratulations from George Cooper at Euston on 27 January. After almost two years of research and filming, Till I End My Song will be seen on the network at 9.00 pm on Tuesday 16 February. It will be previewed at the National Film Theatre’s No. 2 cinema on 11 February. Written and produced by Jeremy Isaacs and directed by David Gill, this documentary records the sights and sounds of the Thames. It looks at the varied activities of the people whose lives centre around the river – from swan-upping to garbage disposal. It is the first Thames programme to be shown in the new peak time documentary slot of 9.00 pm. Early in March the exciting Thames documentary exclusive on the ascent of Annapurna’s south face will also be previewed at NFT2. The programme, The Hardest Way Up, will be seen on the network on 16 March at 9.00 pm. The Annual General Meeting and Elections of the Club will be held on Monday 1 February at 6.30 pm in the Teddington restaurant. Neither Club Chairman Ron Walsby nor Secretary Bernard Burke are standing for re-election. Urgent nominations are required for these posts and the rest of the committee. The Club Committee is responsible for the Club bars (opening hours, service, prices, catering, etc.) and various social activities during the year. It is important therefore that as many as possible vote at Monday’s AGM.